Unstable nuclei, called radioactive isotopes, will undergo nuclear decay to make it more stable. There are only certain types of nuclear decay which means that most isotopes can't jump directly from being unstable to being stable. It often takes several decays to eventually become a stable nucleus. When unstable nuclei decay, the reactions generally involve the emission of a particle and or energy. Half-lives are characteristic properties of the various unstable atomic nuclei and the particular way in which they decay. Alpha and beta decay are generally slower processes than gamma decay. Half-lives for beta decay range upward from 10-2 sec and, for alpha decay, upward from about 10-6 sec. Bismuth-209 has the longest half-life of 2x1019 years. Half-lives for gamma decay may be too short to measure (~ 10-14 second), though a wide range of half-lives for gamma emission has been reported. 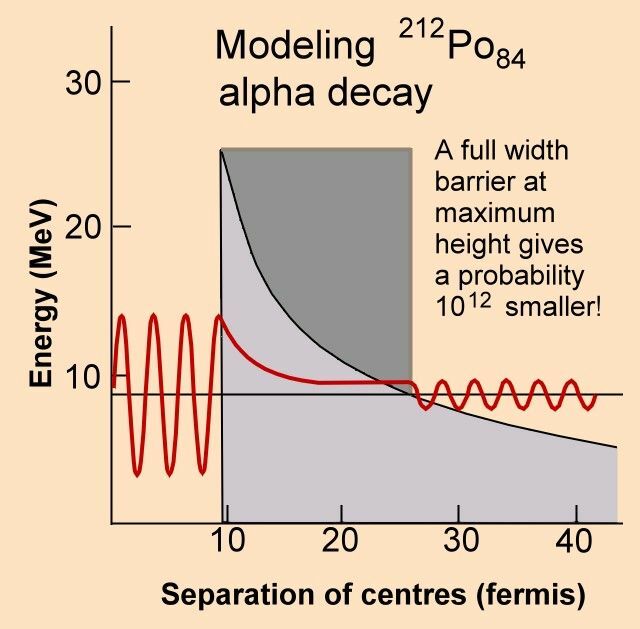 Alpha Decay - The strong force, despite its strength, has a very short range; it can't even reach from one end of a fair-sized atomic nucleus to the other. 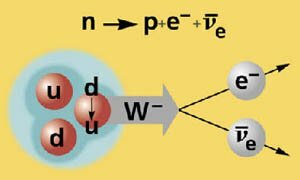 If a proton is at the edge of a big nucleus, it can feel the pulling strong force only from the particles in the neighborhood, but there is an electromagnetic force, which tends to push it out, all the way from the other side of the nucleus. There is a sensitive balance between these two competing forces. The nucleus needs not to acquire extra energy to escape; the quantum mechanical effect called tunnelling allows a certain probability of escape through a potential wall. Alpha decay, in which just a small chunk breaks off from the main nucleus, is a rather mild case of fission; in more dramatic examples, the nucleus can break more or less in half. The broken-off chunk most often is packed into a helium nucleus (alpha particle) because it is in a more stable form. Figure 14-06 shows the effect of tunneling through the Coulomb barrier; the nucleus has a small probability of escape to the outside depending on the height and width of the wall. Beta Decay - The weak interaction is responsible for the instability of "free" neutrons, which decay according to the reaction: n p + e + electron-anti-neutrino with a lifetime about 15 minutes in a process known as beta decay. Neutrons in a nucleus are subject to the protection of the nuclear and the electromagnetic forces from the other nucleons, and they will remain stable provided there are not too many of them. If there are too many, such protection would not be sufficient for all of them to remain stable, and the nucleus would undergo beta decay. Figure 14-07 shows the beta decay process, in which the down quark turns into an up quark (thus changes the neutron to proton) by emitting a W- meson, which decays into an electron and an electron-anti-neutrino. Gamma Decay - In gamma decay, a nucleus changes from a higher energy state to a lower energy state through the emission of electromagnetic radiation. It happens usually after the transmutation of the nucleus; the end product has to re-arrange the occupancy of energy levels in order to arrive at a more stable state. The number of protons (and neutrons) in the nucleus does not change in this process, so the parent and daughter atoms are the same chemical element. In the gamma decay of a nucleus, the emitted photon and recoiling nucleus each have a well-defined energy after the decay. 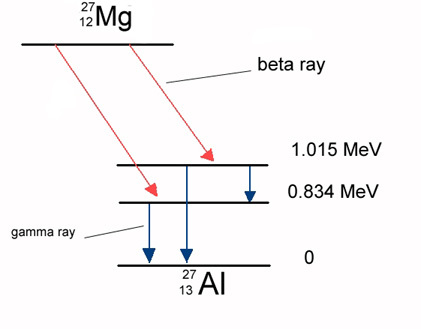 Figure 14-08a shows the adjustment of energy level by emitting gamma ray after Mg has transmuted into Al. 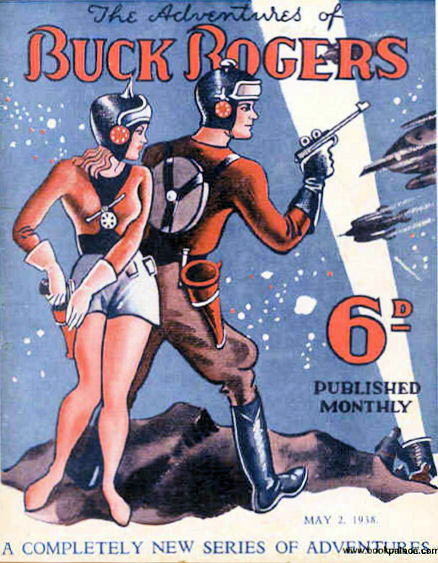 Although the three types of radiation mentioned above have roughly the same energy of a few Mev, their penetrating power is different as shown in Figure 14-08b (in Buck Rogers shooting style). The difference is due mainly to the mass and charge carried by the radiation. 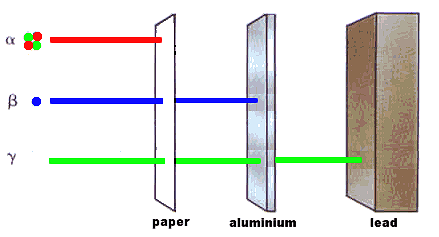 While the alpha ray readily ionizes the few atoms/molecules near the surface of the material, the beta ray with less mass and charge can penetrate deeper. The gamma ray carries no mass and no charge, it depends on direct hit to ionize the atoms/molecules and thus has the most penetrating power. positron meets an ordinary electron the two particles annihilate and the energy contained in their mass appears as two gamma-rays of 0.5 MeV each, flying off in opposite directions. Positron radioactivity is therefore always accompanied by the emission of gamma rays with an energy of about 0.5 MeV in addition to any other gamma-rays which might be emitted. Example isotopes, which emit positrons are C-11, N-13, O-15 and F-18. These isotopes are used in positron emission tomography (PET). Figure 14-09 shows the transmutation of C-11 into B-11 by positron emission. and a neutrino. Since the proton is essentially changed to a neutron, the number of neutrons increases by 1, the number of protons decreases by 1, and the atomic mass remains unchanged. By changing the number of protons, electron capture transforms the nucleus into a new element. Electron capture is also called K-capture since the captured electron usually comes from the atom's K-shell. Figure 14-10 shows another way of transmuting C-11 into B-11 by electron capture. Table 14-01 below summarizes the various types of nuclear decay with a few examples.